An excellent English apple, once grown commercially on a small scale, and worthy of more attention. Chivers Delight is basically a sweet apple, with a family resemblance to Cox's Orange Pippin, but with some sharpness to the flavour. The flesh is quite dense and crisp. 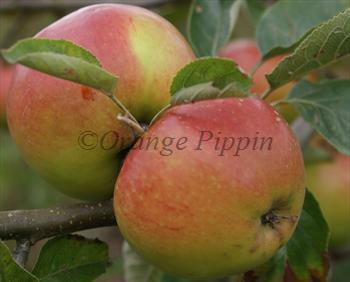 Although not related at all, Chivers Delight is quite similar to Braeburn in size, flavour, and crispness - if you like Braeburn apples you will probably like Chivers Delight. Chivers Delight ripens fairly late in the season, and the apples can be stored for about 3 months in a refrigerator without loss of flavour. Overall a very pleasing well-balanced apple. Chivers Delight is in flowering group 4. Chivers Delight is self-sterile and needs to be pollinated by another tree of a different variety nearby. 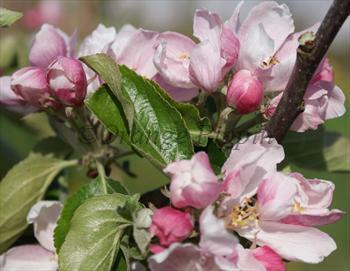 Chivers Delight is a good garden apple, and easy to grow. Cropping is reliable in most situations, but the flavour is at its best in a year with a sunny autumn. Developed in the 1920s in Cambridgeshire by Stephen Chivers of the well-known jam manufacturers, unknown parentage but likely to be related to Cox's Orange Pippin.